宁德志, 邱诗惠, 张崇伟. 毗邻双箱体间水体共振的非线性特性[J]. 哈尔滨工程大学学报, 2019, 40(2), 234-239. DOI: 10.11990/jheu.201803089. NING Dezhi, QIU Shihui, ZHANG Chongwei. Nonlinear characteristics of wave resonance in the gap between twin barges[J]. 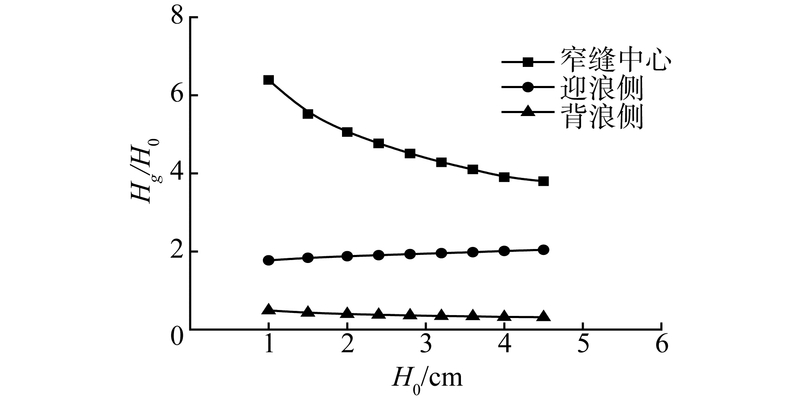 Journal of Harbin Engineering University, 2019, 40(2), 234-239. DOI: 10.11990/jheu.201803089. Abstract: Based on high-order boundary element method, a fully-nonlinear potential flow numerical wave flume is developed to study the nonlinear characteristics of wave resonance between two adjacent barges. Incidental waves are generated by an inner source method. Damping zones are used at two ends of the flume to dissipate outgoing waves. An artificial damping term is introduced to free surface boundary resonance conditions in the gap to approximate the energy dissipation. By comparing the numerical results with the experimental data, we determine the damping parameters in the narrow gap corresponding to different incident wave heights. Our findings show that, with the increase of incident wave heights, the damping strength that represents the viscous dissipation at resonance increases and the nonlinear characteristics of wave run-ups along the upstream side of the barge are enhanced, whereas the resonance frequency of the liquid in the gap is not evidently affected and the dimensionless wave height at resonance decreases. 宁德志, 苏晓杰, 滕斌. 波浪与带窄缝多箱体作用共振现象的模拟研究[J]. 海洋学报, 2015, 37(3): 126-133. 宁德志, 苏晓杰, 滕斌. 波浪与带有窄缝结构作用的非线性数值模拟[J]. 船舶力学, 2017, 21(2): 143-151. 苏晓杰, 宁德志, 滕斌. 孤立波与带有窄缝结构作用的数值模拟研究[J]. 哈尔滨工程大学学报, 2016, 37(1): 86-91. 张婧文, 何广华, 梅蕾, 等.固连双浮体窄缝间水体共振研究[C]//第十四届全国水动力学学术会议暨第二十八届全国水动力学研讨会文集(上册).长春, 2017: 196-201.